The Tommee Tippee Closer to Nature Complete Feeding Set is designed to make preparing your little one’s bottle effortlessly hygienic. Prioritising effectiveness, speed and simplicity, the Closer to Nature Electric Steam Steriliser keeps bottles, teats and feeding accessories safe and free from harmful germs. This chemical-free sterilising system, designed to kill 99.9% of germs on bottles, is the star of the Tommee Tippee Closer to Nature Complete Feeding Set. Now, you can sterilise baby’s bottles in just three simple steps. Fill the base of the Electric Steam Steriliser with 80ml of cold water, load up to 5 bottles, teats and tops, then switch on to start the 5 minute sterilising cycle. We suggest you allow a few minutes for the steriliser to warm up and cool down so the bottles are safe to touch. 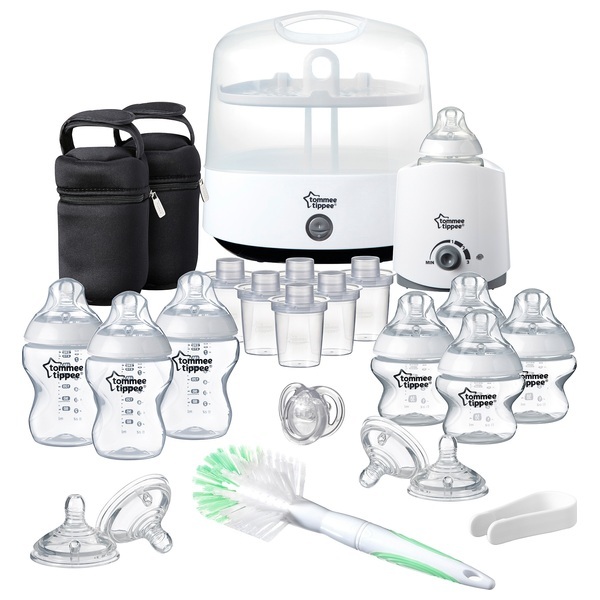 The Tommee Tippee Electric Steam Steriliser is compatible for use with 5 Closer to Nature bottles (8 included) or 4 Ultra bottles (sold separately). Contents now stay sterile for a full4 hours, provided the lid remains closed, so parents can switch on the Electric Steam Steriliser at bedtime and remove clean bottles when it’s time for breakfast. Contents: A Closer to Nature Electric Steam Steriliser, 4 Closer to Nature 260ml/9floz Feeding Bottles with slow flow teats, 4 Closer to Nature 150ml/ 5floz Feeding Bottles with slow flow teats, a Closer to Nature Electric Bottle Warmer, 6 Closer to Nature Milk Powder Dispensers, 2 Closer to Nature Insulated Bottle Bags, 2 Closer to Nature Medium Flow Teats, a Closer to Nature 0-6m Soother, a Closer to Nature Bottle Brush, a teat tongs and an instruction leaflet.